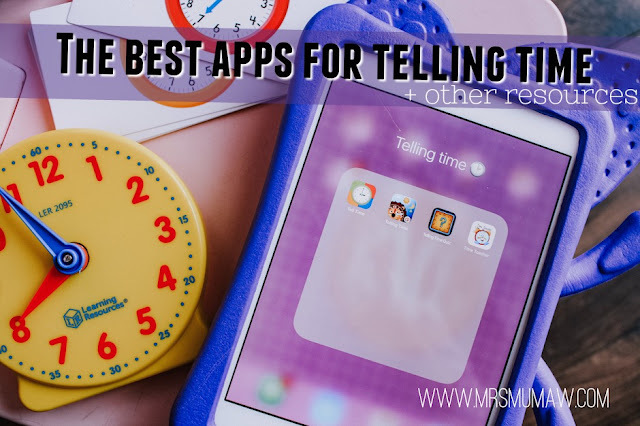 The Best Telling Time Apps + other Resources | the every things. We are in the telling time section of school! It can be harder to learn this without seeing a analog clock little to none for kids now a days. I mean the only clocks we have in our home that our analog, is our huge over sized one, that while it does work and was correct at one time; after I put Halloween fake cobwebs on it it weighed it down & I just haven't put it back to the right time ha! I always like helping out in any areas my kids are learning in, even if they aren't struggling at all. So here are some of our faves for telling time unit. There are such amazing resources with apps to help or strengthen really any unit in school your child is having. So, I shouldn't have been surprised when I found telling time apps. I downloaded pretty much every single one available. A lot were duds. I did the dirty work for ya'll & & put together a list of the best apps out there! This is one of the easier apps for those first learning. You can set the analog clock to what the time that it is showing on the digital clock. This interface is fun for kids compared to the others as well with a cute porcupine! This one is great for the kid that loves beating the clock & unlocking levels. This games is timed & has the clock ticking in the background which always gets the girls heart rate up! The more stars you get, the more levels you unlock! This one is great for fast thinking, on your toes knowledge! This app is different from the others because it has options to Learn, Practice then Quiz yourself on telling time. It has similar features to the first app I talked about by setting the analog clock from the time on the digital. This app has a fun reward system for kids by picking prizes after the levels. The girls love picking fish for their fish tank. This is from one of my favorite app makers! Simple interface. The voice tells the time & they have to click which card has the correct time on them. It increasingly gets harder, & they add more cards. These apps are my favorite because you can set for either all times to be taught, or hone in a certain ones to be working on. You can also record your own voice to use instead of the apps for when they click the correct or wrong card! It's very neat! Next is flash cards. I am a sucker for flash cards. Our collection is intense. But they work! My girls have had flash cards since they were one! ha! Seriously, we love them. So I was thrilled to find these ones! I use the front for her tell me the time, & use the back for her to draw out or use the clock from below to set it. Bringing the apps above in tangible way. This set is ammmazing. It contains the smaller version of the clock, I am pretty sure we all had in our elementary school class room! I use flash cards to show the analog time, then she sets it on the clock. This set also comes with dice, puzzles, dry erase clock & cards. This is set is amazing, & so well priced. I also want to add, that everything comes with reusable zip locks for everything..& that just makes me love it more! This post contains affiliate links, Thank you so much for supporting me & my family!